N. T. Wright is not only a leading New Testament scholar, he is also an important voice on social and political issues facing the United States and Britain. In fact, these two qualifications are really of a piece. When Wright sets about to address “contemporary issues,” like the relationship between science and religion, woman’s ordination, ecology, and the political implications of the Gospels, he is first and foremost concerned with understanding what Jesus and the Apostle Paul have to say in the Gospels and the epistles. He brings his expertise in the socio-political context of the NT to bear on contemporary discussions of gender, science, and politics. The chapters in this book consist of various addresses, lectures, and sermons that Wright delivered between 2004 and 2013. They were mostly delivered to non-specialist audiences, and Wright has a remarkable capacity to translate his scholarship into clear and accessible prose. Those who know Wright’s scholarly works will be familiar with the themes he discusses, but the quality of the writing and the skillful application of NT studies to broader cultural issues makes this volume valuable. There is some repetition of material amongst the chapters, and I found this tiresome at points. That said, chapter 2 on the question of the historical Adam and chapter 3 on science and the resurrection were particularly good. This is a great book for those interested in the relationship between religion and contemporary culture. I recently reread this fascinating little book by James Jordan. As a biblical scholar, Jordan’s work is unique, insightful, and often frustrating. He refers to his interpretive approach as “hermeneutic maximalism.” This means that he looks not simply at the historical-grammatical context of a passage, but that he draws out all sorts of other literary and allegorical resonances as well. Jordan’s approach has much in common with the interpretive methods of the early church fathers who consistently looked for allegory within the biblical texts. As rewarding as this approach is, it can also result in interpretive claims that seem far-fetched and virtually impossible to verify. This can be frustrating, but I also suspect that it suggests that Jordan may be more in tune with the symbolic nature of ancient texts than most modern exegetes. In this particular book, Jordan takes up, among other things, the issue of the sins of the patriarchs (Noah, Abraham, Isaac, Jacob, etc.) in the book of Genesis. He takes issue with the common portrayal (from both liberal and conservative scholars) of these figures as weak, deceitful, and cowardly. According to Jordan, this conclusion comes from a misunderstanding of how heroes are portrayed in ancient texts. What looks to modern eyes like excess (Noah’s “drunkenness” in Gen. 9) or dishonesty (Jacob’s deception of his father Isaac in order to obtain his brother’s birthright in Gen. 27) actually have a much different significance within their respective stories. In fact, the portrayals of these figures are meant to invert many of the assumptions about heroism in ancient literature in order to show that Israel is established as a people not through their own virtues, but through the support of YHWH (the Hebrew name for God). Jordan is a fascinating and original scholar, even while there is much in his work to disagree with. His task in this book be viewed either as revisionary or pioneering – but either way, it is ingenious. This book would be of use to anyone who is interested in Old Testament studies. The Silkworm is the second book in the Cormoran Strike series and I really enjoyed it. I think it sucked me in quicker than The Cuckoo’s Calling but that could also be because I was already more familiar with the characters. Sadie, Jean, and Andrew already read and reviewed this title so I won’t spend too much time summarizing the story. Strike is busier than he was in the first book thanks to the way he handled the Lula Landry case. When he gets a request to locate a woman’s missing husband he takes it, not quite knowing what he’s getting in to. The husband is an author who was in the midst of submitting a book for publication when he suddenly went off the grid. He has a habit of doing this, but his wife feels he’s been gone too long and just wants to know where he is. As Strike takes on the case his assistant, Robin, wants him to see her as more of a partner and less of a secretary. Unfortunately this is complicated by the fact that her fiancé is not happy about her job or her relationship with Strike. So there’s an underlying personal element in the story as Robin tries to get her fiancé to be okay with the career path she’s chosen and as she tries to get Strike to see her potential as more than just a personal assistant. I’m definitely looking forward to the next Strike title. This is novel by Henríquez has been receiving attention since it initially came out. I picked up the audiobook which was narrated by a full cast – a format well-suited for this title which has chapters told from the perspective of various characters. The Riveras are the main family the novel revolves around. Alma and Arturo moved to Vermont so they could enroll their teenage daughter, Maribel, in a school that is best suited to her special situation. After a fall from a ladder she suffered brain damage and the schools in Mexico weren’t able to offer her the kind of support that she needed. There are obviously a number of cultural differences when the family moves to America, the language barrier is just one issue they have to deal with. But as the Riveras attempt to adjust to their new lives, they are introduced to other people and families with similar backgrounds. Those who traveled to the United States for various reasons and have stayed and claimed it as their own. Their stories are interspersed between the Rivera plot line and offer a different glimpse at what the immigrant experience in America is like. Alma and Arturo are doing what they can to give Maribel a better life, but she starts to really show improvement when Mayor, a young man who lives in her apartment building, forms a friendship with her. She appreciates him because when they’re together she doesn’t feel as if he’s treating her differently due to her injury. She feels like he sees her for her and this helps her to improve in a number of ways. Unfortunately her parents seem to be caught up in viewing Maribel as someone to be treated delicately and they don’t want her fraternizing with boys unsupervised, even if they do know the boy in question. The Book of Unknown Americans was well-written and I appreciated that there was more to the story than simply finding out if the Riveras were going to make it. The interspersed narratives with other immigrants added depth to the book because so many of them echoed a similar sentiment of never really being able to escape the labels of “immigrant” and “different.” Despite obtaining citizenship and proudly supporting the country, they always feel they are viewed with an element of suspicion and as being “less than” other Americans. While I wasn’t necessarily blown away by the story, I did enjoy it. Flora is a 10 year old self-proclaimed cynic. She spends most of her free time reading comic books, much to her mother’s dismay. One day as she’s looking out the window of her bedroom she sees her neighbor accidentally vacuum up a squirrel. When she heads outside to help she finds that the squirrel has become imbued with superpowers. Flora names him Ulysses after the vacuum cleaner that sucked him up and the two set off together. Ulysses has an enhanced brain capacity and we learn that he has the ability to write poetry and can fly. A squirrel with superpowers has to have a nemesis… but what happens when that nemesis happens to be Flora’s mother? 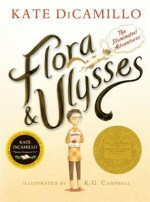 Flora and Ulysses won the 2014 Newbery Medal and I can see how this would be an engaging read for mid-grade readers. The story obviously has fantastical elements, but there’s a depth to the story as well. The illustrations throughout enhance the story and tie in with Flora’s love of comics. A unique and enjoyable read. Ng’s first novel is a unique read that quickly draws you in. Set in a small town in Ohio in the 1970s we are introduced to the Lee family. The family of 5 resembles the American middle class in every way except for the fact that the Lees (Marilyn and James) are an interracial couple – a reality that was far from the norm for the time. Things become difficult for the family when their middle child, Lydia, is found drowned in the local lake. The police are leaning towards ruling her death as a suicide but Lydia’s parents and brother refuse to accept this. Marilyn is sure her daughter had too much going for her and that her death is the result of foul play. James believes his daughter was too social and well-loved to have thrown her life away. And Nathan, her older brother, is sure that the neighborhood “bad boy,” Jake, had something to do with Lydia’s death. It is slowly revealed that the Lydia her family thought they knew wasn’t her true self. She put on the face she thought her parents wanted to see… but that doesn’t help to answer how a girl who didn’t know how to swim ended up drowned in the middle of a lake. Now her family is left to try and pick up the pieces of their lives because Lydia’s death has thrown them all off track in one way or another. This was an engaging novel that keeps the reader going as they try to find answers for what happened to Lydia and how her family will begin to heal from her loss. I’ll be curious to see what Ng comes up with next. The Madness of July by James Naughtie takes place over 6 sweltering days in July 1976. It is a political/spy thriller set during the Cold War. The main character, Will Flemyng, is a British Intelligence spy turned Minister in the Foreign Office. The novel revolves around an American that is found dead in the House of Commons. The dead American has Will Flemyng’s phone number in his pocket. Will has no idea why the dead man has his phone number. There is also a parallel story in this book. Will is one of three brothers. The oldest brother, Mungo, has discovered a secret about their mother which could change the family dynamics. The three brothers meet at the family home to discuss Mungo’s discovery. With the dead body, the family secret, and several other sub-plots, I thought that I would enjoy this book more than I did. The plot seemed disjointed. I found myself lost on more than one occasion. There are many different characters whose loyalties are either hard to remember or aren’t as they appear. The family secret never gets fully resolved. I am left to wonder if we will be seeing more of Will and his family in future novels. This is James Naughtie’s first novel. Perhaps, his second novel will be more enjoyable.